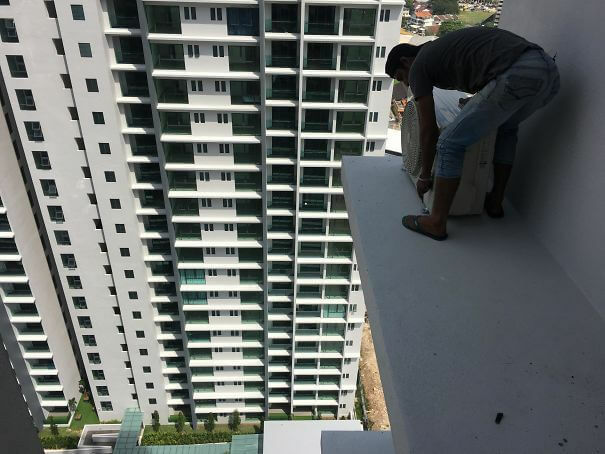 If you have ever heard that women live longer than men, it’s for a variety of reasons. Biological, social and lifestyle factors are associated with their different life expectancies, but there’s something missing. The obvious factor is that men simply take on such silly tasks. These days, anyone can question whether or not men have any real intelligence based on their definition of ‘personal safety’ or their ability to plan for the worst-case scenario. It might be sad, but it’s tragically hilarious too! If it is stupid but it works, it is really stupid? I mean, there’s a guy waving a flag though, so it looks kind of safe? 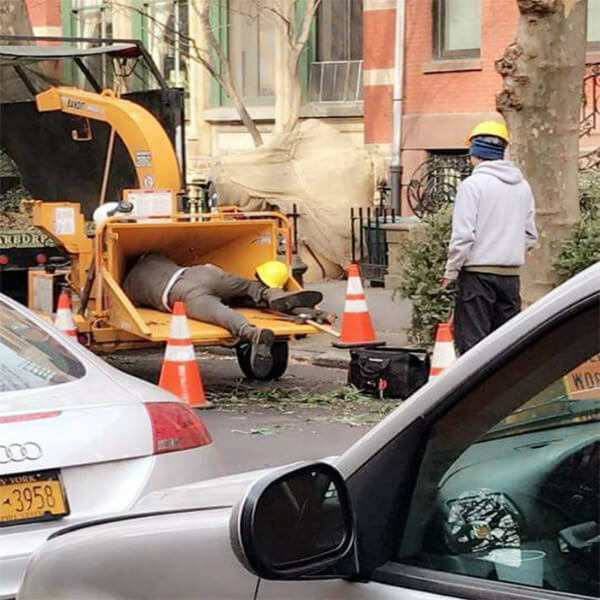 It looks okay because if you get any chance to lay down on the job, you better take advantage of that. As long as he doesn’t fall asleep, he’s good to go. 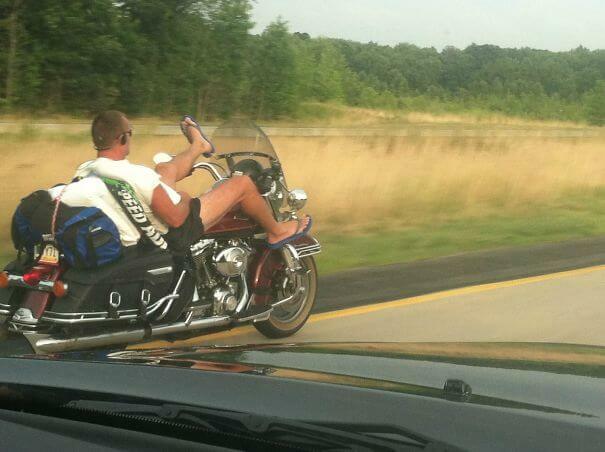 Oh man, this guy has a lot of nerve to be out there, especially in flip-flops. Your stomach will instantly lurch whenever you see these high-rises. Sure, the view is beautiful and all, but looking down will also give you anxiety with a side of sweaty hands. *NOM NOM NOM NOM NOM* That machine is going to be full for weeks! 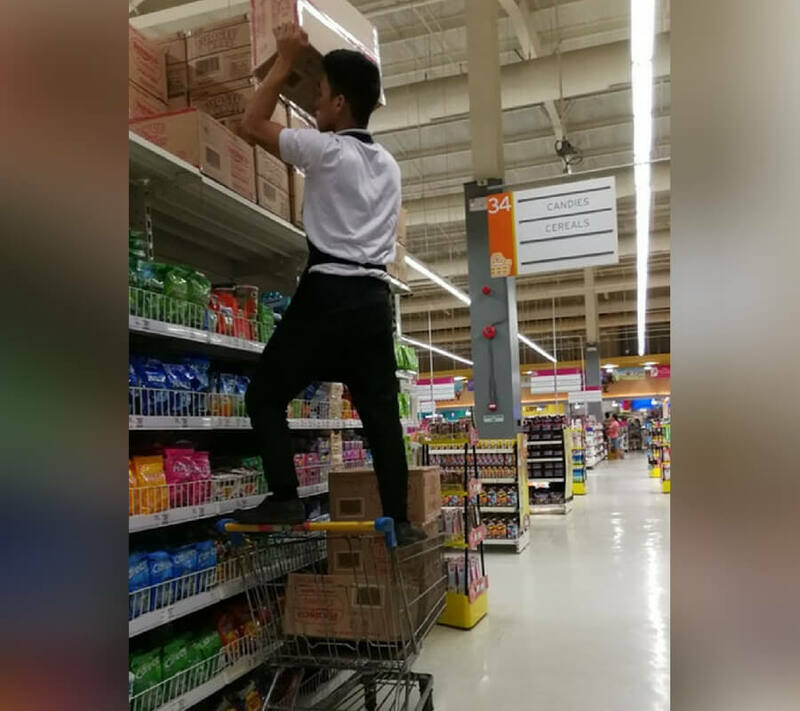 You might cry out in pain the second you catch a glimpse of this worker going above and beyond. Not going to lie, but this does remind me of Fargo. Not the television series, but the cult-classic film by the Cohen brothers. Sometimes, the ‘Do not operate if under the age of 18’ doesn’t apply, like the one up ahead. 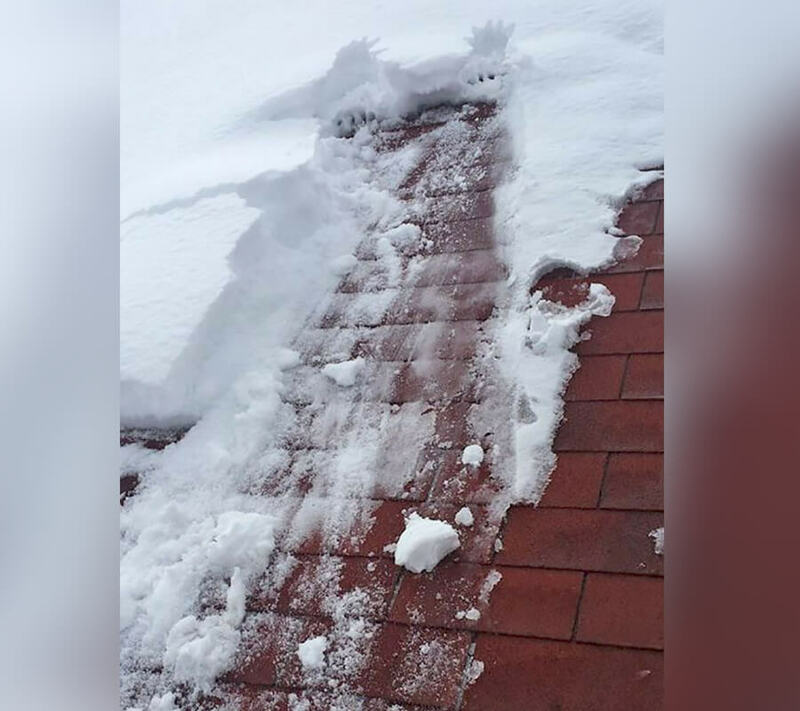 Talk about natural selection in the process. I really hope he doesn’t cause a crash with another vehicle thanks to his lackadaisical attitude. 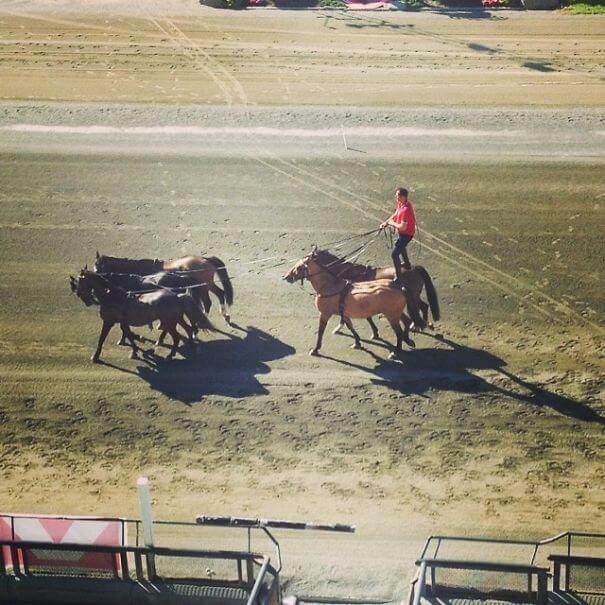 Who knows, maybe the horses might live longer. But, they will never look as cool as this ever again. In fact, I once saw a girl do this at a rodeo and it was something that stuck with me to this day. Too bad Johnny Knoxville and the gang never thought of this for one of their stunts. No Need To Lock This, I Got It! Hey, look! It’s the modern day Iron Maiden! I guess the ‘Do not operate if under the age of 18’ doesn’t apply here. It makes you wonder about the numerous situations that could occur. This sort of thing makes me uncomfortable since he climbed right in without giving it a second thought. He’s lucky he wasn’t killed, and the same goes the for the next guy ahead. 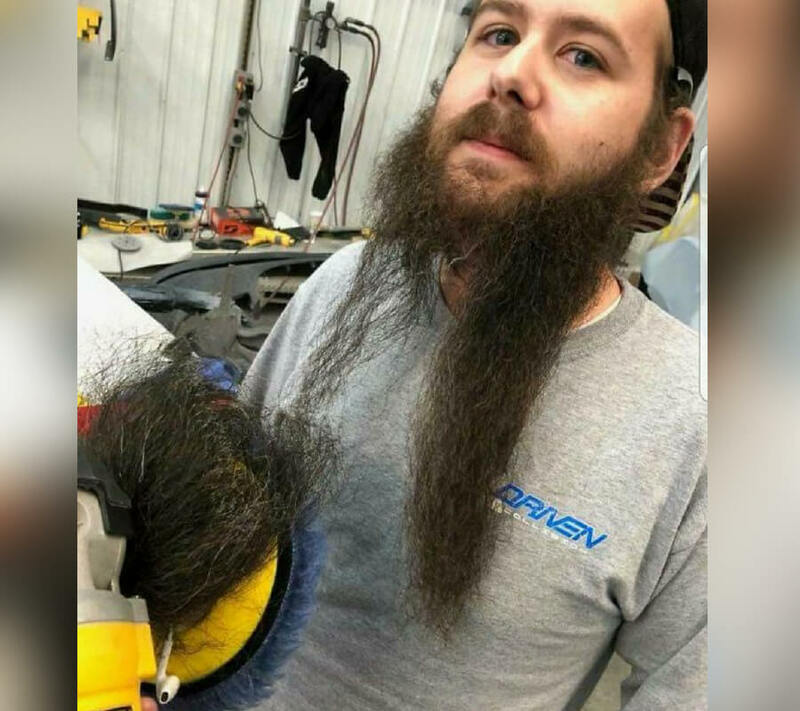 It’s an important reason why men shouldn’t have long beards while operating machines. Whenever people think they have a crappy job, they should refer to this. That would be enough for you to never complain about your job. That poor man better gets a good paycheck for this. This is not an acceptable thing to expect a human to do, but desperate times call for desperate measures. There’s a good chance he’ll need a robotic knee after this. Ah well, he’s young anyway. He’ll learn in the most difficult way ever. You should praise his confidence because it’s clearly riding at an all-time high. 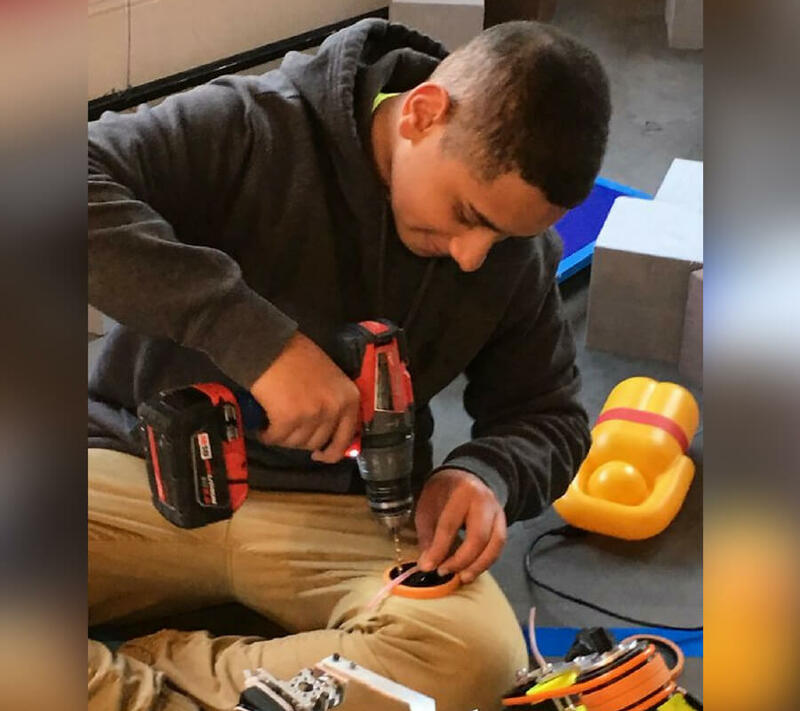 I really hope this is a demonstration of what not to do with drills. Gee, this guy is super lucky. His long hair could have had him killed by the machine. Also, he’s lucky that his hair tore instead of ripping out of the skin. He certainly didn’t see this coming, but guys with long beards working with machines are asking for it. Still on the way, using a water bottle as a shield doesn’t mean you know what you’re doing. The journey began with three kids on the trampoline and he sprung into action to make sure they had the time of their life. 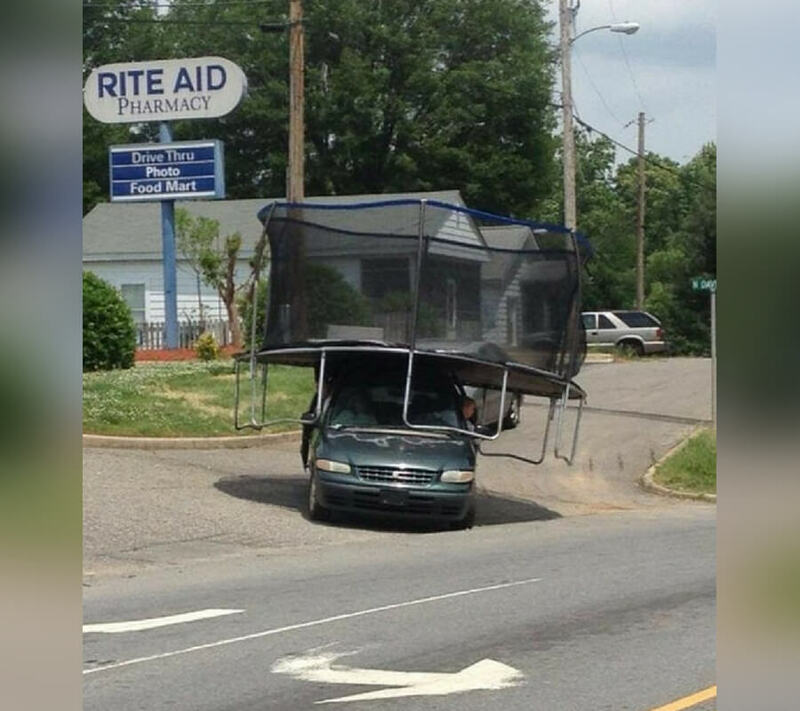 I’m pretty sure that trampolines come apart to make it easy if you want to transport it to another spot. It’s crazy but pretty darn impressive. 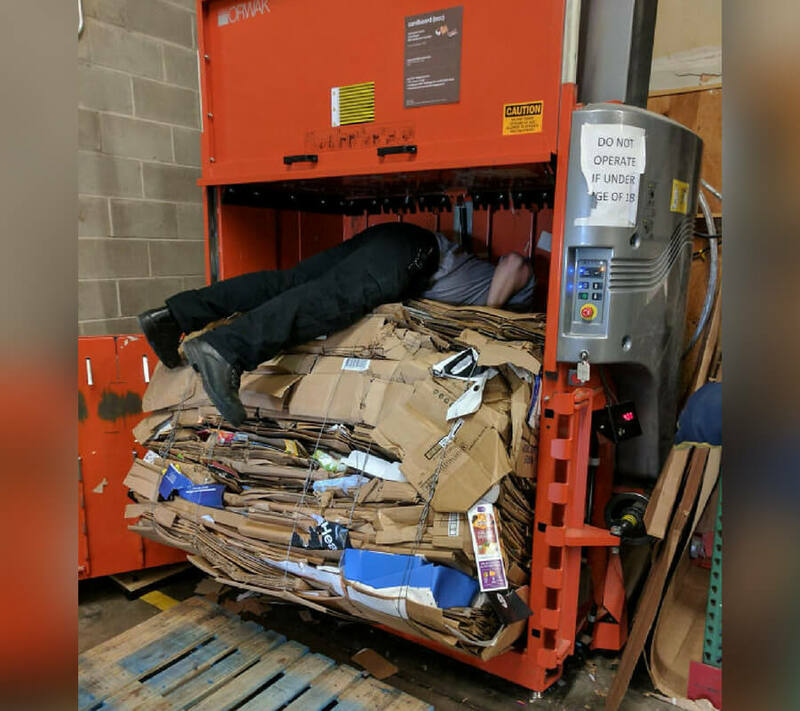 I used to work at a grocery store in high school and if our manager caught us doing this, it was straight outside to wheel in the carts. But, if he falls and breaks a couple bones, it won’t be a pleasant time dealing with HR. Nothing says it’s flammable. The real issue here is that he didn’t have a guard on the angle grinder. 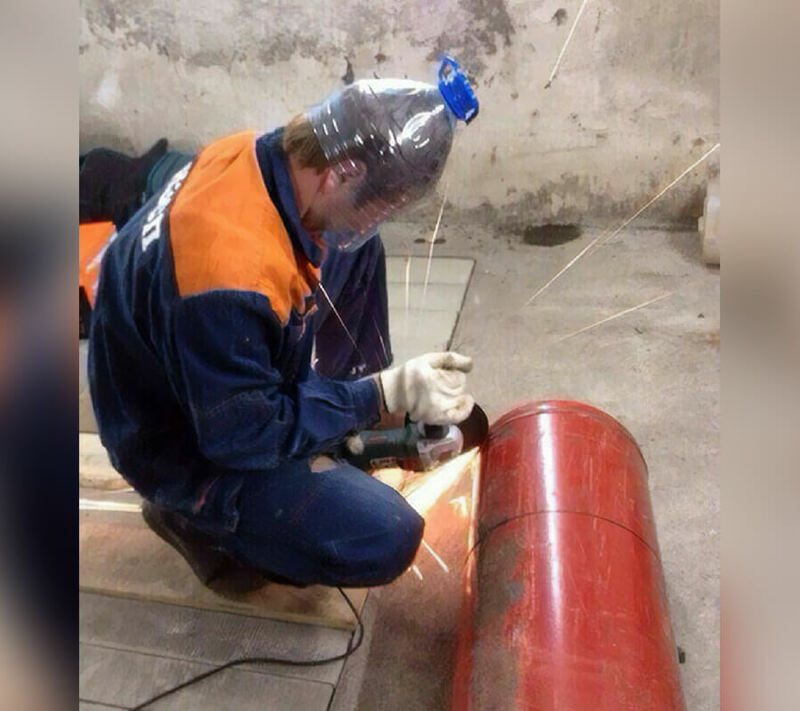 At least he has something to protect his eyes from the sparks, and made sure to put some gloves on. However, wearing a plastic bottle doesn’t mean you know what you’re doing. You may want to pay attention to the next one shortly. 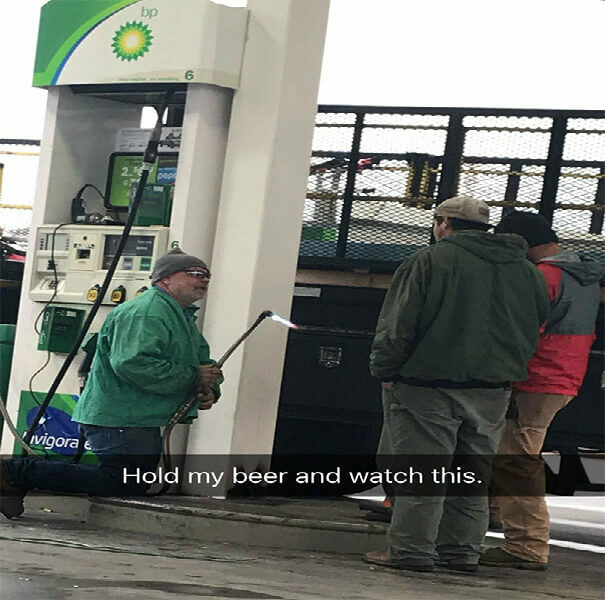 It’s no different than lighting up a cigarette near a gas tank. The guy with the crutch is the key factor behind all of this. To me, this almost looks like a Renaissance painting. The composition is beautiful and it’s kind of similar to Tetris. 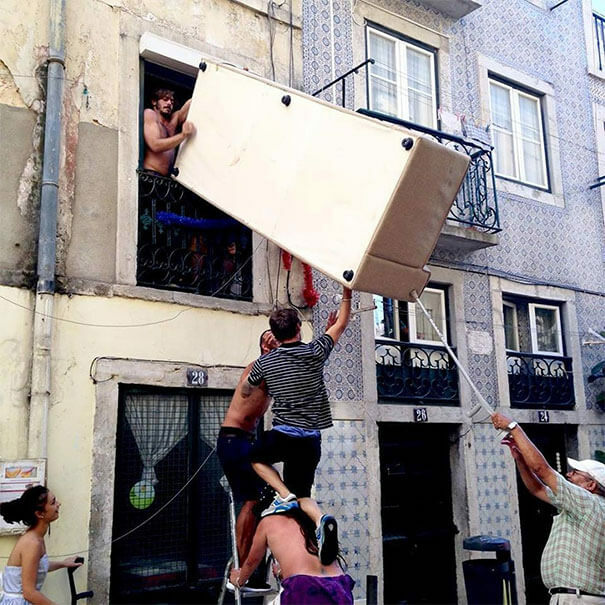 It doesn’t look like the couch will go through the window, but anything is possible these days. 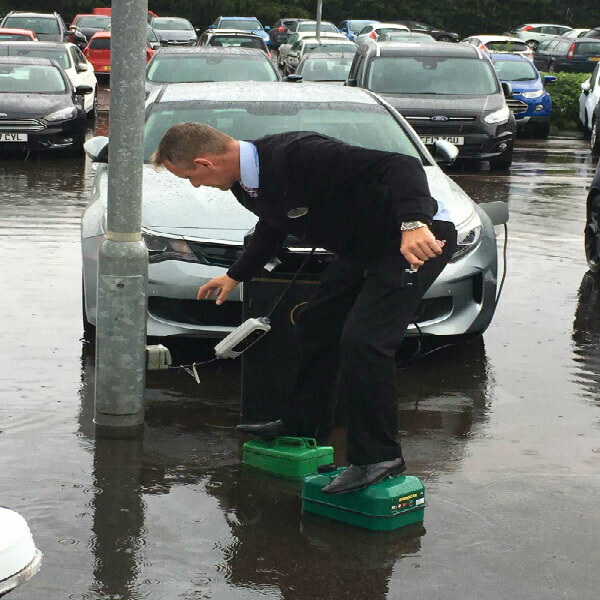 It’s difficult enough to navigate through these waters, but wouldn’t he would be better off if he was on the hood of the car? Oh well, not my fault this guy is in this situation. Hopefully, the boys pumped all the gas out and this guy is doing the repairs. I mean, it’s no different than some schmuck lighting up a cigarette near a gas tank. Both parties should know better than not to do this sort of thing. Or else, the big explosion will be the talk of the evening news. 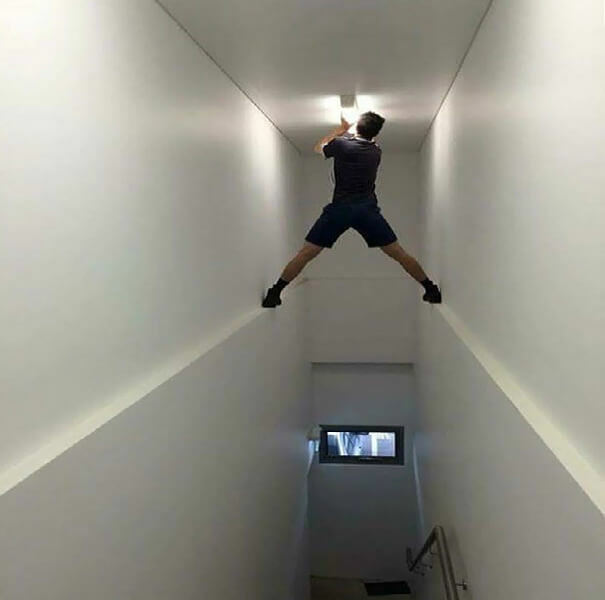 Just ahead, don’t be too concerned when you don’t have a ladder. You might be more flexible than you think. There is so much to worry about here. Like, what’s the purpose of the chair being placed there? I really can’t wrap my head around it. The guy at the bottom must be so strong he could do this if it was an Olympic event. But for now, let’s hope nothing unfortunate happens. Santa Clause, is that you who fell? If you take a closer examination, you can see the handprints where he tried to stop his fall. Our mothers were wrong after they told us that these things only happen in cartoons. But, this is proof that the jolly man in the red suit could be real. I’ll admit my buddy from college did something similar to this. She would always change our lightbulb in our staircase and she didn’t fall down once! We offered, but she insisted because she was “more flexible.” However, the most awkward part was watching her get down. The guitar riff from the Black Sabbath single just popped into my mind. Honestly, how can you resist that temptation to do something this cool? This might be one of my favorite GIFs ever, but I’m curious to know what triggered him to try and pull this off. Bruh, Do You Have A License For That? Well, they always say that necessity is the mother of invention. I mean, it looks like it’s working, but the smaller one looks to have one strap to tie it down. 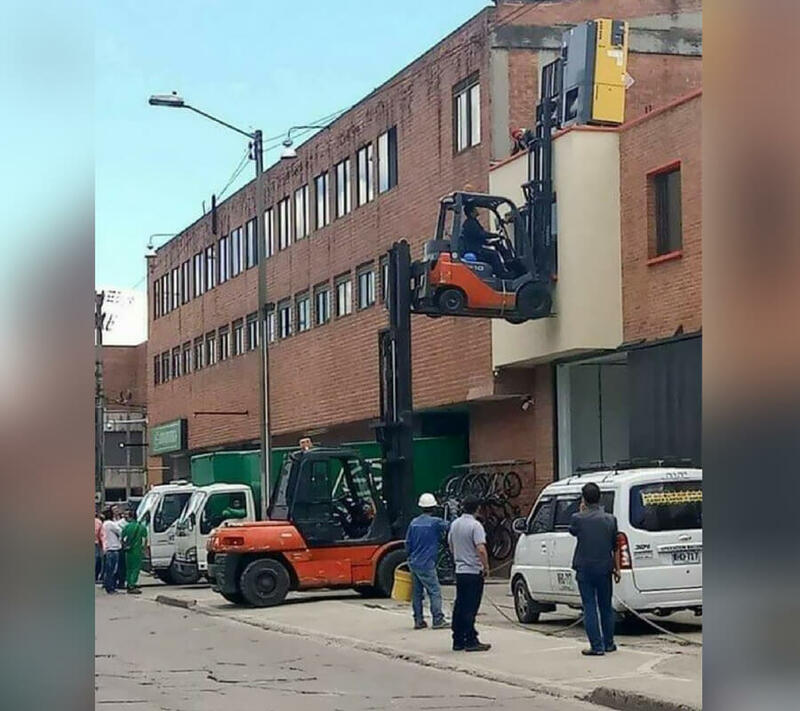 It’s not like a zip tie will keep that together, but who doesn’t love a double forklift these days? 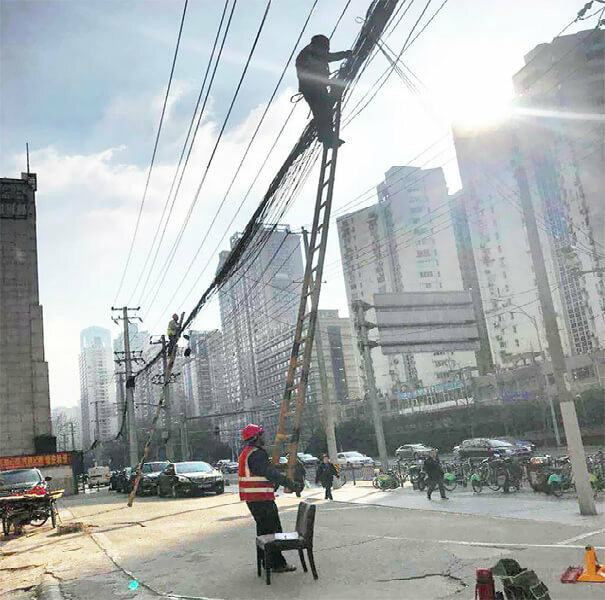 Hopefully, the health and safety department doesn’t drive by.